We went to Target again recently to pick up a few things (oh, how I love Target… if only we had a SuperTarget… but then I might never be home, and the whole being frugal thing would be a lot harder!) and stopped by the markers/crayons/paints aisle to pick up some art supplies for J. Brian is an artist, and I really like art & design, so it’s exciting to us that J is finally getting interested in coloring. I knew he’d done some painting at day care because we have several of his paintings hanging up around the house, so I thought it would be fun to get him some paint to work with at home. I have to admit something. We walked down the aisle, and I was completely drawn to the box of sixteen little tubs of paint – including teal, my favorite color. I showed them to J, and said, “Oh, look – do you want to get these paints?” He looked at them briefly, then shook his head and said, “No, Mommy. Let’s get this!” as he grabbed the $1.97 watercolors. You know the kind of paint I mean, because I don’t know anyone who hasn’t used these watercolors. It’s the little oval pads of paint housed in the plastic tray, a bright yellow paintbrush tucked away in a trough beside them. I remember opening and closing the hard plastic case over and over when I was a child, loving to hear that click. Well, despite my fondness for the watercolor set, and its inexpensive price, I still tried to persuade J to go with the tubs of paint. They looked like more fun to me, never mind the fact that they cost $4.97, more than twice as much as the watercolors. He shook his head at me again, and we went home with the watercolors. We promised him he could paint if he ate a good dinner (picky eater=bribery at dinner time sometimes), and he did. After the table was sufficiently cleared we set him up with supplies and he got right to work. He went through three pieces of paper, but not quickly. I was surprised at how long he worked on each sheet, because in coloring books he tends to move from page to page pretty quickly. I showed him how to dip the brush in the water and then tap it on the side of the dish before dipping it in the paint. I said, “Tap, tap, tap,” as I showed him, and he apparently thought that was part of the process, because he said it each time. It was a lot of fun watching him pick the colors, saying each one as he decided to use it. Like I mentioned, we ended up with three works of art – a couple we’ll probably send to grandparents, and one we’ll find room for on our refrigerator. He’s already asked to paint again, and I have a feeling this $1.97 set of paints will provide countless, priceless hours of fun for J. 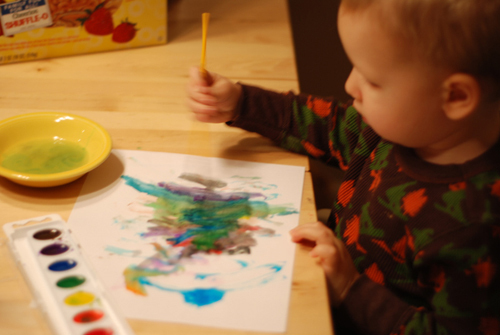 Our little artist, hard at work. I think this is the one we’ll keep for ourselves. I’m probably just a tad biased, but I really like it! Brian and I both love to cook. I think if we ever won the lottery and didn’t have to work, we’d both probably go to culinary school and open our own restaurant/bakery. That’s seeming pretty unlikely, so we just have fun experimenting in our kitchen. In our city, we have a decent amount of Asian restaurant options, but none that we’re in love with. I’ve wished for a long time that we would get a Pei Wei – one of our favorite places to go when we visit the Dallas/Fort Worth area. Their Kung Pao chicken is amazing… I’ve actually got to quit writing about it because I’m getting hungry for it now, and it’ll probably be a month or two before I get access to it again! All that being said, we try making Asian food at home pretty often. 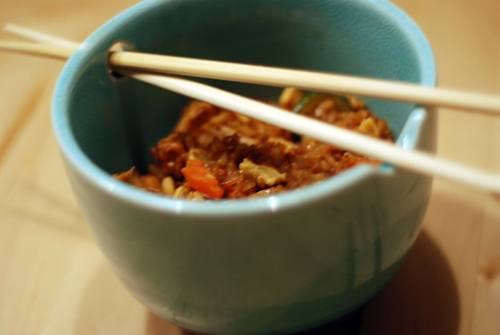 We’ve never found a recipe that replicates Pei Wei (I’ve looked, though!) but we have a couple of staple favorites. One is chicken teriyaki. I love it because I almost always have the ingredients on hand, and it’s an inexpensive meal that makes plenty of leftovers. We usually make our chicken teriyaki with white rice, but last night we were at Target and happened to notice a deal on Uncle Ben’s 90-second brown rice – it was on sale, and some kind soul left a coupon right beside it for another 50 cents off. Score! So, not only was it cheap, but it knocked a good 14-18 minutes off of the time it took to make dinner. 1. Scramble eggs in a large saute pan. Once they’re cooked, remove them and set them aside in a bowl. In the same pan, use 2 teaspoons of olive oil (I just eyeball it) to saute diced zucchini (I cut it into half-moon shapes), onion, bell pepper, and carrots. While the veggies are cooking, follow instructions on the Uncle Ben’s rice to cook it in the microwave. 2. While your veggies and rice are cooking, you can also work on the chicken. In a small saute pan, cook your chicken in a very small amount of olive oil. I begin cooking my chicken as whole tenderloin strips, and then as it cooks I use the spatula to cut it into bite-size pieces. I only do this because it saves me the clean-up of utensils gross with raw chicken germs! I digress. After the chicken has cooked until it is no longer pink, add two tablespoons of teriyaki sauce, moving the chicken around to coat evenly. I cook it on medium because I like how the sugar in the sauce kind of caramelizes on the chicken – yum! 3. Add the rice, and 2-3 tablespoons of butter, to your veggies. Stir to mix, and let the rice and veggies cook in the butter for several minutes. Then add soy sauce to taste. I didn’t measure this at all, but probably added a tablespoon at first, and then a little more until it had the flavor I wanted. Cook this mixture a little like you would hash browns – leave it alone for a little while to let the bottom layer “crisp” a little, then mix up and do it again. This gives the rice a nice texture. 4. Add the chicken and egg to your rice & veggies, and combine the elements until the chicken and egg are distributed pretty evenly among the mix. Ok, now I’m hungry again – Off to heat up our leftovers. Hope you enjoy this as much as we did! I’ve been a little apprehensive about writing a first post, and I can’t figure out exactly why. I mean, after all, I’m pretty much my only reader right now. I guess it’s because I feel this post is the first step down my path toward trying to actually change my habits and live more frugally, and I don’t want to get off on the wrong foot! If you are reading this and want to know a little more about me, check here. Those are the basics about who I am, but I figured I’d use this post to explain how I got to where I am now. Not in a physical sense, because I haven’t moved around too much in 28 years – but how I got to being more serious about trying to live a more frugal life. When Brian and I first got married he was a senior in college, so we lived off my salary alone. It was more than what we needed, and we felt like we had a lot. Fast-forward almost seven years – a dog, a house, and two children later… We’ve definitely noticed that even though our disposable income has increased, it sure feels a lot smaller. Day care, student loans, grocery bills for four, a mortgage, car payments, and some credit card debt add up quickly and eat into what we have available for saving and for fun. I’m sure a lot of people experience the same situation. We decided first and foremost that we wanted to pay off our credit card debt. A lot of that was acquired through dumb choices, and the interest rate is insane. To do that, we need to cut back in other areas. Some things are pretty common sense – using coupons, looking for sales, not eating out as often – but I want to find other ideas too. I want to find options that will work for our family long-term so this can really be a lifestyle change and not just a temporary fix. I’ll fully admit there are things we’re not willing to give up at this point – cable, internet, being a two-car family – so we have to find areas in which we can realistically make sacrifices or cutbacks to trim down our debt. I’ve always done better at sticking with things when I self-report. At work, if I have something written in my planner to do, I’ll actually feel bad until I’m able to legitimately mark it off as completed. I figured this blog could help keep me accountable. It’ll be here, glaringly, if I make a dumb purchase – and I’ll get to come brag if I score a good deal or find a new way to save. Wish me luck!